2:00 pm: Shadows of the Singer and the Star – A Blue Rose Adventure. A new adventure for the upcoming edition of the Blue Rose Romantic Fantasy setting using the AGE (Adventure Game Engine) rules from Fantasy Age, as seen on Titansgrave: Ashes of Valkana. 5:00 pm: Beneath the Surface (a body painting workshop by Brandon McGill, whose work I’ve admired for some time – I’ve got a game to finish up, but I’m hoping to attend part of it). 10:00 am: Whatever Happened to Stonewall? – An Icons Adventure. An adventure for Icons Superpowered Roleplaying. 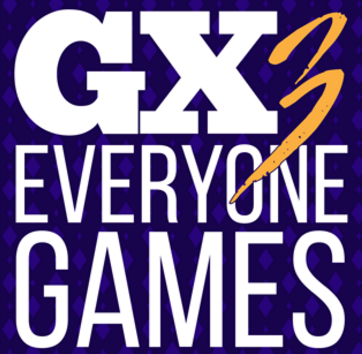 3:00 pm: Queer as a Three-Sided Die panel – We bring the popular GenCon panel to GaymerX! 2:00 pm: The San Jose Event – A Mutants & Masterminds adventure. Gamemastered by Joseph Carriker, based on the setting of his forthcoming novel Sacred Band. I’m just hoping to play in this one (if Joe lets me…). Plus we’ll see what other things I can get into – there’s a ton of cool stuff going on and, presumably there will be goodies to shop for, along with a number of people I’d like to meet, and old friends to visit. You can follow me on Facebook or Google+ or on Twitter at @SKenson, as I’ll probably be updating social media while I’m at the con, or just as a way of messaging me while I’m there. This entry was posted in Conventions and tagged blue rose, cons, gaymer, gaymerx, gx3, icons. Bookmark the permalink.